Virginia Mainella first appears in the Painesville, Lake County, Ohio, area in 1947. In America, Virginia Mainella was known by her married name, Virginia DiCarlo. Virginia Mainella, daughter of Filippo Mainella and Maria Teresa Pacicco, was born on August 15, 1905, at Frosolone, Isernia Province, Molise, Italy. She married Pasquale DiCarlo sometime before 1923 in Italy. 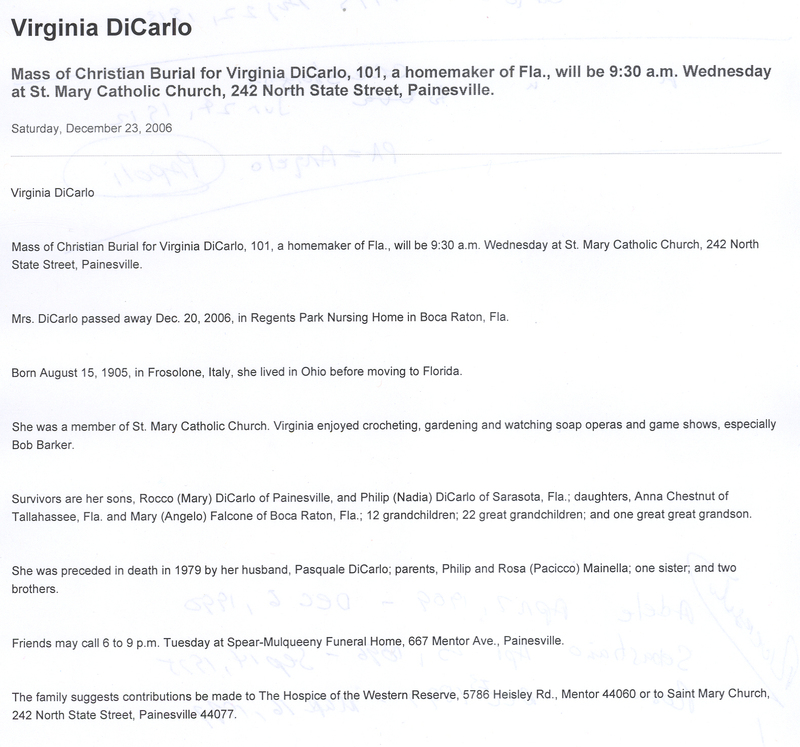 Virginia died on December 20, 2006, at Regents Park Nursing Home, Boca Raton, Palm Beach County, Florida, at age 101. Her body was interred at Riverside Cemetery at Painesville, Lake County, Ohio. Virginia Mainella immigrated to the United States on October 28, 1947, at age 42, travelling to Painesville, Ohio. She was joining travelling her husband, Pasquale DiCarlo, in Painesville. Virginia immigrated with two of her children, Filippo DiCarlo and Maria Grazia DiCarlo. Virginia Mainella’s sister, Maria Assunta Mainella (wife of Vincenzo Meo), lived in Painesville from 1938 until her death in 1991.